I made this necklace from jump rings I made as a chain, then added swarovski bicones and pearls on stick pins and the larger black beads are black glass beads. I tried different things with this chain, and this is what I finally came up with. The picture does not do it justice. 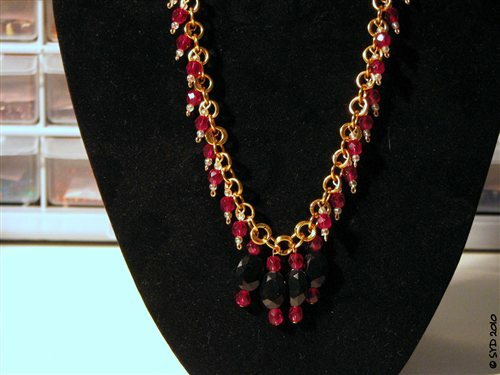 The swarovski crystals are garnet and are a deep blood red in color. The pearls are AB and have a beautiful shine to them. I took me about 2 1/2 nights to make this, but it was fun seeing it come to life. Feel free to leave comments as it helps me to improve. Thanks, and have a great day !